The sharp shinned hawk (Accipter striatus) is a small hawk (10 to 14 inches long) that is about the size of a mourning dove. The female sharp shin is larger than the male, but both sexes have about the same colorations (slate gray backs with light colored chests and abdomens highlighted with rusty colored bar markings). The sharp shin has a long, square tipped tail that is marked on its ventral side with dark and light bands which terminate in a solid white border. This hawk also has short, rounded wings, and red eyes. The name “sharp shin” arises from the appearance of their thin, un-feathered, lower legs. The sharp shin is an ambush style of predator. A typical hunting strategy is for the bird to perch in an inconspicuous place (like a well sheltered limb in a coniferous tree) and then burst out unexpectedly onto its prey (small birds). The sharp shin is extremely quick and acrobatic in their pursuit of their prey. They often take prey in the air or may even pursue and capture on foot if needed. Their pursuit of prey, though, is very short-termed. If a capture is not quickly made, the hawk breaks off its chase and returns to another ambush location. In addition to consuming small birds, sharp shins also prey upon small mammals, reptiles, and even insects. In our area, bird feeders, often to the dismay of the feeder’s owners, have become an increasingly common site for sharp shin ambushes. After catching a bird, the long talons of the hawk easily and fatally pierce into the prey’s vital organs. The hawk then retires to a “plucking stump” where it removes the prey’s feathers prior to consuming it. Sharp shinned hawks are, in turn, preyed upon by marsh hawks, Cooper’s hawks (a slightly larger hawk that greatly resembles the sharp shin in plumage and coloration), red-tailed hawks, and peregrine falcons. The sharp shinned hawk is widely distributed across North America. Its summer breeding range extends into northern Canada, and its year-round ranges include the northeastern, northern midwestern, far western, and northwestern United States down through the mountains of Mexico. It winters in the southern United States, Mexico, and Central America. Censuses of the sharp shin’s migration numbers indicate that the northern ranges of the hawk are increasingly supporting the bird through the winter (i.e. fewer sharp shins are being counted in the southerly migration masses). Possibly, this reflects the impact of bird feeders generating a rich and predictable enough source of winter prey items for the sharp shin that it’s energetically demanding and perilous migration event can be avoided. 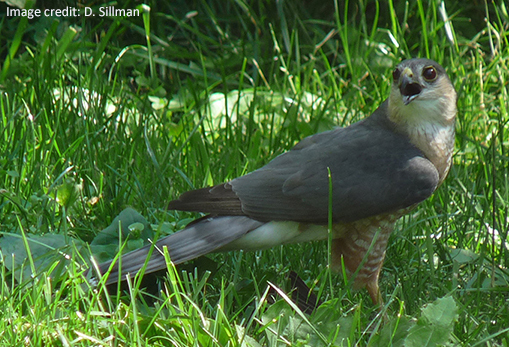 Sharp shinned hawks are widely dispersed through their summer breeding ranges. The breeding pairs, though, do establish and vigorously defend a breeding territory. The males display in the territory and attract a female (breeding age is two years of age). Breeding behaviors include circular flights and side-by-side perching with “peeping” vocalizations. The male and the female both are involved in gathering nest materials after they have bonded but only the female actually constructs the nest. The nest is a broad, flat platform made up of conifer twigs with a lining of bark. Typically, the nest is located in a tall, coniferous tree on horizontal limb at heights ranging from some thirty-five feet above the ground down to only ten feet off the ground. Sharp shins may re-use their previous year’s nests or even use the old nests of crows or other hawks. The sharp shins only have one brood of young a year but may, if the first batch of eggs is destroyed, lay a replacement clutch. They lay three to six eggs (with four being the most common number) with two day intervals between each egg. The eggs are bluish-white to purple or even greenish. They may also have a cinnamon-brown tint to them. Incubation of the eggs typically begins after the third egg is laid and lasts for thirty days. The nestlings grow quickly and have very large food requirements (each nestling may consume three small birds a day!). Male nestlings fledge by the twenty-fourth day after hatching while the larger female nestlings fledge by the twenty-seventh day. Fledges perch in trees near the nest and are fed (sometimes in mid-air!) by the parents for another two weeks. The average life span of a sharp shinned hawk is three years although individuals that are ten years old or older are not uncommonly found. Nestling and fledgling mortality rates are very high and juveniles also have a very high mortality rate in their first fall and winter. Populations of sharp shinned hawks decreased greatly between 1940 and 1972. Much of this decrease was due to the impact of pesticides (like DDT) that accumulated in the tissues of these high order predators causing both direct poisoning of individuals and a pesticide induced thinning of egg shells that led to massive losses of eggs during incubation. Numbers have rebounded since the banning of DDT in the United States but continued use of these banned pesticides in Central America and the on-going destruction of forest habitats in both the United States and Central America still severely stress the species. Sharp shinned hawks are listed as “threatened” in Tennessee and “of special concern” in Kentucky. Several other states list the sharp shin on their conservation watch lists.